Blizzard Entertainment today made wildly popular real-time strategy game StarCraft a free download for Mac and PC, nearly two decades after its original release. 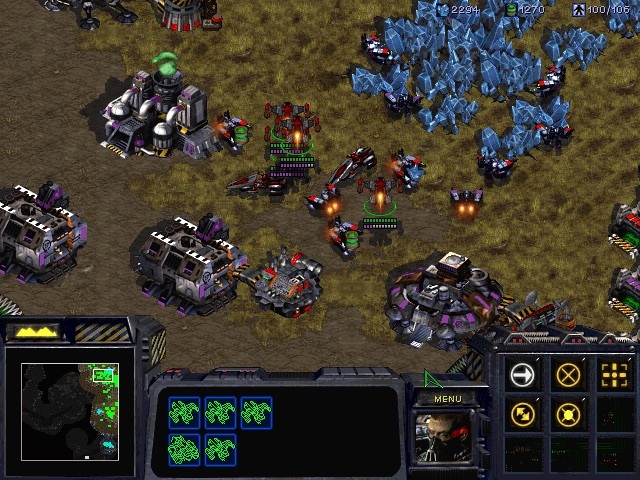 The RTS hit was universally acclaimed when it launched in 1998, and went on to become an e-sport phenomenon in South Korea, where big-prize tournaments and TV channels drew legions of fans to the game. The free download is the game's first in eight years and includes the Brood War expansion pack. The patch 1.18 download also sports a handful of new features, including windowed mode, a better online game search engine, and improved response times during multiplayer battles. Blizzard's decision to make the title freely available comes ahead of this summer's Remastered edition of StarCraft, which promises enhanced 4K graphics, better audio, high-quality cinematics, and a redesigned matchmaking system. Making vintage StarCraft free also offers a unique opportunity for getting in some practice before the new version is released: Blizzard says owners of the original game and the remastered edition will be able to play each other online. Nostalgic gamers can find the free download of the original StarCraft here. Just in time to settle the N/S Korean crisis in a peacefull way! this is the so called Starcraft remastered? Reading the post may help answer that. I will be getting Remastered when it comes out, but mainly just for the campaigns. I tried playing a bit of SC1 again recently when they were doing the public test of 1.18, and the ancient UI was a lot more clunky than I remember from my childhood. I'm sure I'll do some multiplayer with my friends who I play Starcraft 2 with now, once Remastered is out, but frankly I'm spoiled by having rally points and multiple building selection in Starcraft 2 and even Warcraft 3. For those who watch the occasional Brood War pro game out of South Korea, Remastered will be a real boon. I'm hoping this might generate some new interest in Starcraft 2. The campaign stories aren't as good (I would argue) but the multiplayer is a lot of fun and still going strong with the latest expansion that came out a year and a half ago. The 1v1 ladder is the most competitive it's probably ever been, but it'd be nice to have new blood in the lower leagues. If all you want is the original SC campaigns, you should play StarCraft Mass Recall. It's a fan done project - they remade all the StarCraft and BroodWar campaigns in the StarCraft 2 engine, including levels that were cut, only available on the N64, or only available by download. They did a phenomenal job - completely blew me away. ~60 people worked on it for almost 10 years (the project started in the WarCraft 3 engine - they shifted it over to StarCraft 2 when that was released). I wrote the Mac installer for it... although I haven't maintained it at all. They have some more involved steps you can manually follow for the Mac, or I can link to the installer I wrote if you want. Unfortunately North Korea has insufficient Vespen Gas to research a technology which will allow them to actually run Starcraft. Nostalgic gamers can find the free download of the original StarCraft here ('https://starcraft.com/en-us/articles/20674424'). I'm liking this trend of rebooting old classics. Epic Games, please please please reboot the original Unreal Tournament! Finally I can play it again since i lost my code. Ooh they made it Intel-compatible also? I thought it use to be only PPC. Does this work with Sierra or OS 8 only?